Fifty years ago a group of women — mainly from New York — wanted to stage a very public demonstration about women’s rights. They didn’t choose a political locale (i.e. Supreme Court or White House) or an economic one (i.e. the Fed or Wall Street), instead selecting a cultural setting. 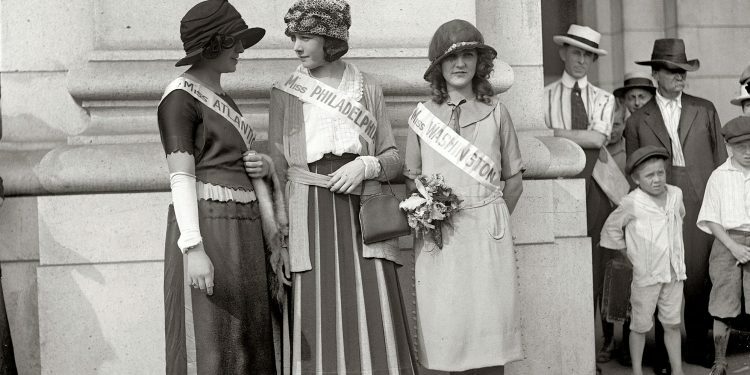 In an Olympic year with a dramatic Academy Awards (postponed after the assassination of Dr. King) the protestors chose a different pop culture event: the Miss America Pageant. It’s never entirely accurate to point to a specific event as the start of a social movement, but in this case it’s generally recognized that this protest signified the start of the “second wave” of feminism. While The Feminine Mystique was published in 1963 and the National Organization for Women was founded in 1966, the 1968 Miss America protests are seen as the most public announcement of the start of the women’s civil rights movement. Just about 50 years before, in 1921, Miss America had begun the year after women’s suffrage. By 1968 the event looked quite different. Yes, the contestants still wore bathing suits (while modest by today’s standards, the 1960s suits were significantly more revealing then in the 1920s). But they also performed a talent, had an interview, and were awarded scholarships to pay for college and/or graduate school tuition. Yet those bathing suits were paired with heels, and those talent costumes were worn with false eyelashes and hair falls, and this seemed incongruous with the goal of women’s education. Why did you have to look a certain way to win? It’s worth noting that even then the “ideal” wasn’t as clear cut as you’d might think. In actuality more brunettes had won than blondes, and the heights of the winners were all over the map. However, they were all slender no matter their height — which could be enhanced with those high heels, along with bras and girdles. It was the latter items that were the focus of the ire of the protestors in September 1968. These women were sick of being physically uncomfortable by female fashion so they tossed those symbols of oppression into the trash can. They were also sick of feeling like looks were first order (even at Miss America!) no matter your talent or intellect. Fifty years later, Miss America is still limping along in her now six-inch heels (often with “toe overhang,” if you don’t know, Google it). Since the late 1960s the number of contestants is down from 70,000 to 12,000. TV ratings are down, too. In 1968, the year of the protests, the NBC broadcast was seen by a whopping 64% of the viewing audience. In 2017 that number was 1.5%. And yet interest remains — for much the same reasons as in 1968. Miss America is a cultural touchstone. This year Miss America has seen more publicity than in decades after a #MeToo inspired-scandal that, through a variety of decisions, led to the end of the swimsuit competition. Tumult continues as the newly invigorated women’s movement (with the 2016 presidential election as the touchpoint) has spawned a variety of other activity around women’s rights in the workplace, and beyond. The 2018 Miss America protests (over blasphemy, bathing suits, and bullying) are much more internal. But they are perhaps the final mini-earthquakes that will destroy an organization that already has a lot of foundational cracks, many of which began in 1968 based on bras. So let’s check in fifty years from now, yes? In the meantime, I’ll be watching carefully on TV on September 9th, most likely wearing neither bra nor bathing suit. Hilary Levey Friedman teaches in the Education Department at Brown University and she is writing a forthcoming book on the links between beauty pageants and feminism.